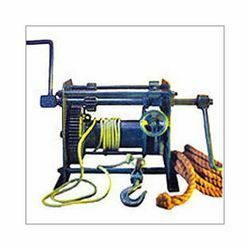 These Crab Winches with right hand operation are manufactured and also the same can supplied with other side operation also as per requirement. Reducer: 1st stage reduction with self-made worm reduction gear box or of reputed make and other reduction with open. Bring forth an exclusively designed and developed range of Manual Crab Winches has helped us in achieving an enviable position in the industry. We ensure clients that, products we deliver to them are in compliance with IS – 9507-1979 standards. Our experts precisely manufacture these products, keeping the specific demands of clients in mind and ensure to deliver them within the stipulated time. Our products are available in the market at reasonable prices.